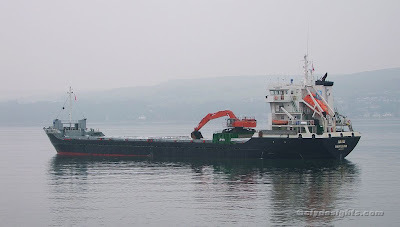 The last ship to be shown on ClydeSights this year is AASLI, the Norwegian mini-bulker that has recently been employed on the busy Glensanda-Clyde aggregates run. She arrived this morning and is currently anchored at the 'Bravo' anchorage prior to moving to Greenock in the first few days of the New Year. A fleetmate of hers, AASHEIM, was pictured on New Year's Day, similarly awaiting a berth in Glasgow. Once a regular caller on the Clyde, AASHEIM has more recently been employed elsewhere.